Professor Igor Bray is a world expert on atomic collisions. Now he’s applying what he learned while studying atoms to solving problems in life. In Perth, on the sunny west coast of Australia, lies Curtin University – one of the top-rated science and engineering universities in the country. The university’s School of Physics sits in one long building near the centre of the university’s campus. On its ground floor, laboratories flank a long corridor. Through glass windows passers-bye can see the complex machinery of physics. Hardware such as the electron microscope and mineral analyser feed into computers, where researchers delve into the microscopic world. On the floor above is Professor Igor Bray’s office. The head of Physics and Astronomy at Curtin University, he has just returned from a trip to Harvard University, speaking on atomic and molecular collisions. A whiteboard stands nearby holding the complex arithmetic that governs these tiny particles and their movements. These collisions are the work of his career and have made him a global figure in physics. When asked what drew him to science as a child, he admits his natural curiosity and love of logic existed early – so early he can’t remember a time before science held his interest. The methodical approach Professor Bray takes to his calculations has served him well in both life and work. With a career spanning roughly 30 years, his work features in some of the most frontier-expanding science in the world. Analysing mighty supernovae, treatment of childhood brain cancer, and the engineering behind fusion power all require his team’s work on atomic and molecular collisions. “I love the symmetries of mathematics and the application to real-world problems. I realised while I was at university that, as much as I love mathematics, I really wanted to apply it to real things. The transition from pure abstract to something practical and real is very interesting. I also loved science fiction, the imagery and imagination associated with those ideas,” he says. After graduating from the University of Adelaide in 1986 with the PhD paper Gravitational Lens Effect of Galaxies and Black Holes, he began his research career at Flinders University of South Australia, before moving to Perth, Western Australia to eventually become head of physics at Curtin University. He is now the chair of the WA branch of Australian Institute of Physics. As well as teaching, his work features in the International Thermonuclear Experimental Reactor, set to be the world’s first power-supplying fusion reactor. Once completed, it will use sea water as fuel, providing a clean and readily-available energy source. Professor Bray’s work is also used in proton therapy, one of the most technologically advanced forms of cancer treatment. It involves firing protons to destroy tumours without damaging the body like traditional X-ray treatments. His team developed the convergent close-coupling computational approach to atomic and molecular collisions. It is the most accurate computational theory to date and involves mapping particles as they collide with each other on an atomic level. Professor Bray’s research requires supercomputers to simulate and test these complex particle interactions. The team occasionally use Canberra’s National Computing Infrastructure. However, the bulk of research is conducted at Pawsey Supercomputing Centre in Western Australia. Professor Bray’s team has used the Pawsey facilities at their processing capacity since the centre’s foundation in 2000. Here, the team works with the Magnus supercomputer to test their theory with different atomic projectiles. “Our careers are critically reliant on supercomputer technologies. In 1999 we thought we were making great progress in the unsolved three-body problem of electron impact ionisation of atomic hydrogen. Around Christmas, I woke up to find somebody else on the front cover of science; they beat us to it. The reason they beat us was they were using the number one supercomputer in the world at Lawrence Livermore National Laboratory,” he says. 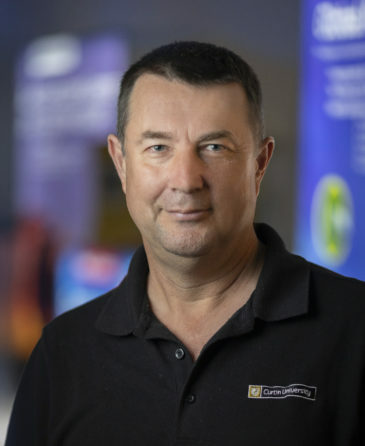 Professor Bray also brings a sense of humour to his work, creating public lectures with Monty Python references and proudly listing his Curtin University table tennis championship wins alongside the more auspicious awards by international bodies for his research. An impassioned and engaging speaker, as well as a highly-regarded scientist, Professor Bray often perforates his scientific findings with near-philosophical comments on the scientific method’s application to greater life problems. We’re critically reliant – our careers are reliant on supercomputer technologies. One of the presents I got in 1999 – we thought we were making great progress in the unsolved three-body problem of electron impact ionisation of atomic hydrogen and almost Christmas in 1999 I woke up to find the front cover of science beat us to it. At the time they were using the number one supercomputer in the world. What we were doing also did the job, but we didn’t know that until later. You can read Professor Bray’s case study here.